Cracker Barrel Old Country Store is giving you a chance to enter to win a country music road trip for SIX, with a weekend getaway in a private motor coach traveling to the summer's best live country music festivals! The winner also will get a $1000 Gift Card for spending money. Grand prize winner will receive a music tour for winner and up to five (5) guests. Trip details: Trip will take part between July 15, 2016 and July 18, 2016; if winner cannot travel on stated dates the prize will be forfeited and no other consideration will be provided. Winner and guests fly from contiguous US to Detroit on July 15, 2016; if winner or guest lives within 150 miles of Detroit ground transportation may be provided. 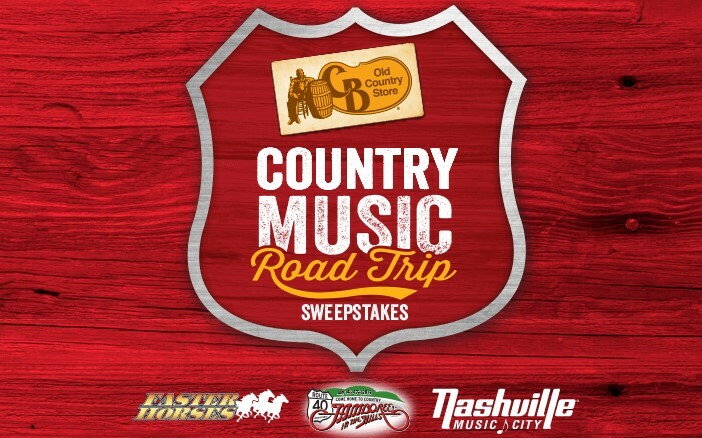 Tour Bus / Van will pick up winner and guests at airport and take them to first festival – Faster Horses on July 15, 2016. Winner and each guest will receive a ticket to Faster Horses for July 15, 2016. Winner and guests will be able to go to and from the bus parking location to act as a haven during the day at Faster Horses. Food and drink will be provided on bus, any additional food want or needs will be at cost to the winner or guest. At 12:30AM on July 16, 2016, winner and guests must be on bus to prepare for trip to next festival. Winner and guests will sleep on bus overnight and wake up in Belmont County, OH at a hotel. Winner and guests will check into hotel to shower and freshen up before heading to Jamboree in the Hills (Belmont County, OH). Bus will stop at Cracker Barrel on July 16, 2016 for a meal. Winner and each guest will receive a VIP ticket (if applicable) to Jamboree in the Hills on July 16, 2016. Winner and guest will be able to go to and from the bus parking location to act as a haven during the day at Jamboree in the Hills. At 12:30AM on July 17, 2016, winner and guests must be on bus to prepare for trip to Nashville, TN. Winner and guests will sleep on bus overnight and wake up in Nashville, TN and arrive at a hotel on July 17, 2016. Winner and guests will check into hotel to shower and freshen up before enjoying an evening downtown (Nashville, TN). Winner and guests will check out of Nashville hotel and have ground transportation scheduled to the airport on July 18, 2016. Winner and guests will fly from Nashville, TN to hometown; if winner or guest lives within 150 miles of Nashville ground transportation may be provided. Winner will be given a $1,000 Visa gift card stipend to use as he or she would like. Approximate retail value of the grand prize is $29,180.00. HINT: Despite the fact that they consider this a one time entry sweepstakes, you do want to see the rules for details on exactly how to enter and you can actually wind up entering daily if you follow their directions on how to get bonus entries!